I tried my first French meringue at a tiny little shop set in an outdoor strip mall near our family home in Southern California when I was about 12 years of age. Anchored by a large Sears Roebuck's and set amid a smattering of even less glamorous establishments, a Parisian patisserie it was not. And yet, it was just as enchanting and charming to my pre-tween palate and perspective as if it had been. Though I can't recall the name of the shop, it was owned and operated by a woman of European heritage, the mother of a school friend. 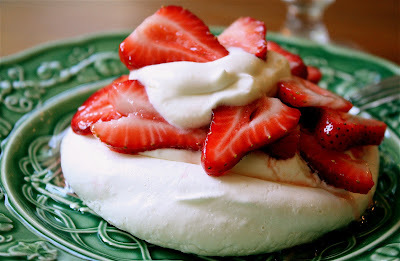 To this day, I believe she made the best meringues I've ever had... billowing clouds of crisp meringue, generously filled with a light, slightly sweet and completely ethereal whipped cream that was then covered with a cascade of fresh, sliced strawberries. They were heavenly. would be a staple in my little dessert arsenal... but no. It really wasn't until just recently at a friend's dinner that I remembered just how much I loved those meringues. At the end of our dinner, five of us shared a large piece of Boccone Dolce cake... a tower of beautiful meringue layers separated by sweet Chantilly cream and fresh strawberries; the whole thing drizzled with ribbons of dark chocolate. It was heavenly. And so, when it came time to think of a dessert appropriate for a birthday dinner I was hosting, I immediately thought of meringues... single little pillows of crisp French meringue filled just like the ones I'd had as a young girl. Meringues are a very easy (and surprisingly light) dessert. They are basically just egg whites and sugar. Not complicated. There are really just two things that you absolutely want to make sure you do... get as much volume in your egg whites as you can, and bake them to a crisp without browning or cracking them. And the only real culprit to impeding either of those two efforts is moisture! So, a drippy (or humid) day is not the day to make meringues. Most everything you read says to make meringues on a sunny, dry day. However, given the fact that it has been raining here, nearly nonstop, for months (!&?##!! ), I settled for a dry and gray day where the clouds hovered high and serene, letting in more light and promise than we've come to expect lately. Not a heavenly day (for meringues at least), but good enough. 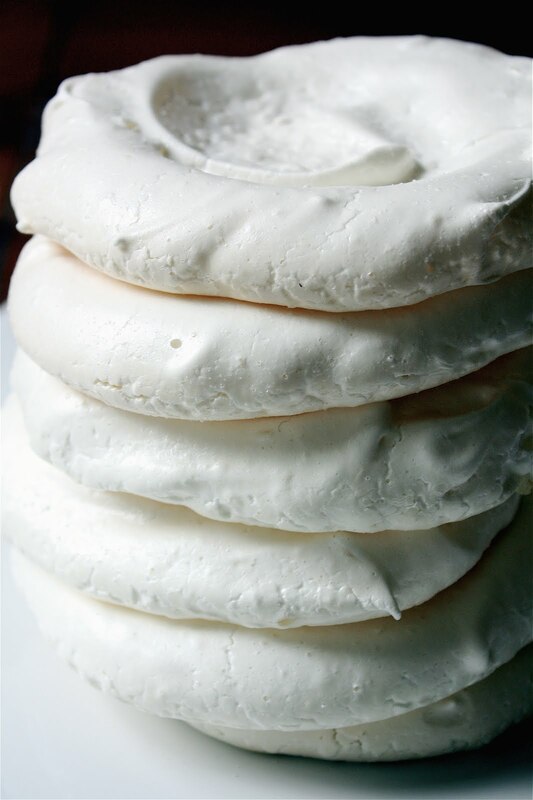 The trick is to bake meringues slow and low. Then, let them sit... and sit. There are so many variations on the best way to bake meringues, some that suggest baking for long hours and resting them in the oven overnight, to others that suggest a quick hour of baking and another hour of rest. After reviewing a few recipes, I ended up melding the recipes of Ina Garten and David Lebowitz. I like the addition of cream of tartar (as recommended by Ina) because it works as a stabilizer in whipping whites, helping to add volume. It also keeps sugar from crystallizing so your meringue will be smooth and silky. And, I like the idea of using some confectioner's sugar (as David recommends) as it takes little or no time to break down. You don't want sugar granules remaining in your whipped egg whites (undissolved sugar attracts moisture). The resulting meringues turn out extraordinarily light and crisp, brilliantly white, and demurely sweet. The Chantilly cream is a perfect filler for these little pillows, equally light and ethereal, and beautifully flavored with a blanket of fresh strawberries that have just a hint of sweet-tart flavor. Heavenly! • Separate egg whites while cold (one at a time in a separate bowl before adding to mixing bowl to avoid any trace of yolk in your whites) -- let them set out for at least 30 minutes -- whip them at room temp. • Use glass or metal bowls only. Grease and fat inhibit volume in whipping egg whites and plastics tend to retain these inhibitors. • Use a fine grade granulated sugar as it more readily dissolves. 1. Preheat oven to 200 degrees F. Line baking sheet with parchment paper. 2. Whip egg whites, salt, and cream of tartar in metal bowl at medium speed until whites begin to appear frothy. Increase speed to medium-high and continue whipping until whites just start to hold together. Begin adding sugar, one tablespoon at a time, until all sugar is added. Increase speed to high, add vanilla and whip until whites are glossy and stiff. 4. Remove bowl from mixer, sift confectioner's sugar over top and gently fold in until fully incorporated, being careful not to deflate whites by over mixing. 5. Drop a spoonful of meringue onto parchment-lined baking sheet. With back of spoon (dipped in water and shaken to remove excess), carefully flatten whipped meringue from center out, leaving a slight outer rim to create a shallow bowl-like shape. Continue with remainder of meringues, using first shape as a guide for spacing (or, use a pencil to draw circles on reverse side of parchment if you want a definitive guide). 1. In a separate bowl, combine whipping cream, sugar and vanilla. Whip on medium speed until cream begins to hold together a bit, then increase to high until stiff peaks form. 1. In another bowl, combine strawberries, sugar, and lemon juice in a large bowl. Toss gently to combine and let set for at least 30 minutes to macerate berries. Cover and chill in fridge until ready to serve.